Faderfox UC3: everything you need in a compact package. 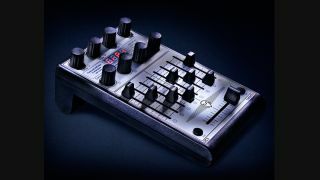 Faderfox has launched the latest in its long line of diminutive MIDI controllers, the all-purpose UC3. This programmable device is designed for users of all kinds of software and is compatible with Mac, PC and iPad (via a Camera Connection Kit). You get eight push encoders and nine faders, though the fact that these can be assigned to eight groups means that you can effectively have up to 136 parameters at your fingertips. There's a crossfader onboard, too. The UC3 can be programmed with the help of a 4-digit display and a dedicated script for Ableton Live 8 comes included. Find out more on the Faderfox website: the UC3 can be ordered now for €169.